Ukraine’s parliament adopted Thursday legislation allowing more than 20 sanctions to be applied against Russia, including a halt to energy transit through the country. The new law on international sanctions was supported by 244 members of parliament, with 226 votes needed for a majority. The adoption of the legislation doesn’t mean the special economic restrictions will be applied automatically; it just creates the legal basis for applying them. The law provides the option to introduce more than 25 types of sanctions on other countries, foreign legal entities and individuals, which according to Kiev are involved in financing terrorism and support the separation of Crimea from Ukraine. The sanction options include blocking and freezing assets, a ban on business activity in Ukraine, barring participation in privatizations, halting the use of licenses and all transit through its territory. Special economic measures also involve a ban on financial transactions, as well as a ban on entry and movement across the country. According to the law, sanctions must be approved by the National Security Council and are introduced by presidential decree. This applies to all of them, except those sanctions related to international treaties. 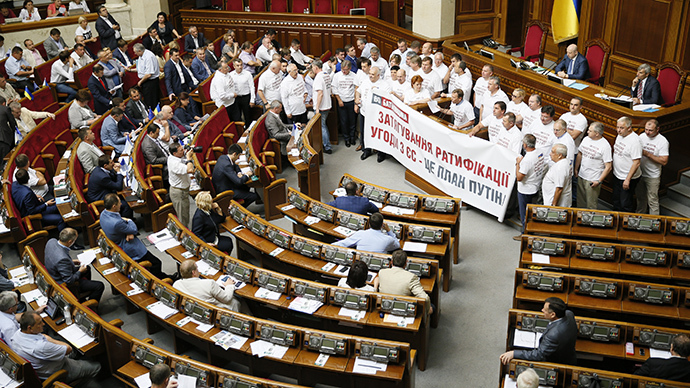 Those decisions will be made by the country’s parliament, the Rada. On Tuesday the parliamentadoptedthe first reading of sanctions against Russia as members disagreed on a number of issues and needed further debate.